Allowed complete dental, nasal and sinus evaluation in one procedure. 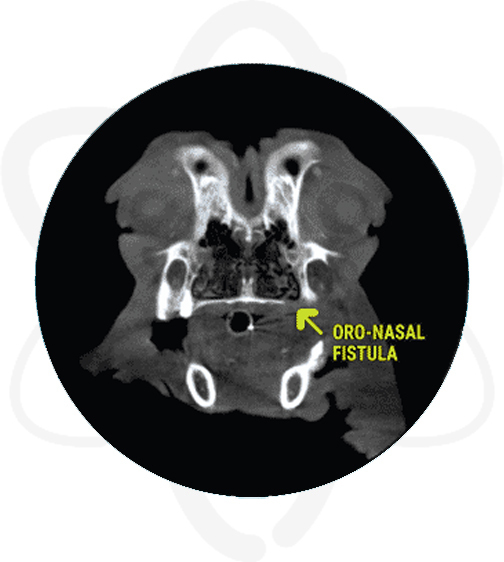 Discovered oro-nasal fistula not appreciated on intraoral radiographs (IOR) which can explain the clinical signs and provided detailed information for surgical planning. In cases of dental disease, dental X-rays are a great modality as an initial step especially when evaluating specific details of the teeth (i.e. types of resorption, periodontal ligament, lamina dura cases, etc). However, in unresolved cases in which IOR (intra-oral radiographs) have not yielded a cause, CT becomes an important tool since it can reveal lesions that superimposition would make impossible to see on IOR, such as oronasal fistulas. CTs are also useful in cases of maxillofacial fractures, tumors/cysts and TMJ pathology. As technology advances, CT scans will play a more important role in the evaluation of dental and nasal structures. 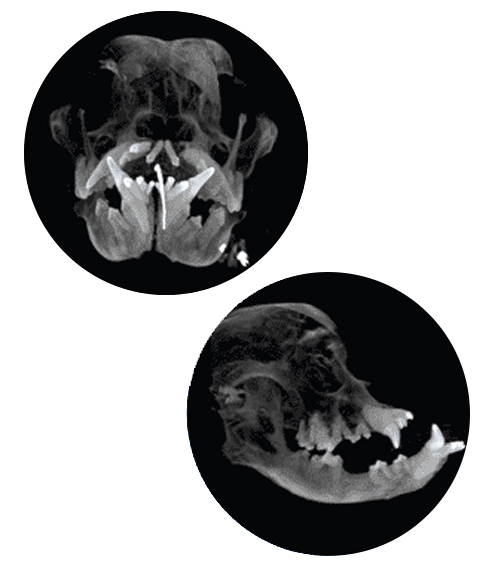 A 2016 study states “it is unnecessary to routinely perform IOR following CT (when acquired and reconstructed in 0.5 or 1 mm slice thickness) when testing for endodontic disease in dogs because there is a high level of agreement between techniques and between observers. This recommendation also is true for periodontal disease, except for when evaluating the mandibular incisors.“1 At MPI, our slices are at least 0.6mm, meeting this requirement. Our equipment performs a dental CT scan in only 30 seconds, which makes anesthesia time very short (10–20 mins. pre and post contrast). 1 Campbell RD, Peralta S, Fiani N and Scrivani PV (2016) Comparing Intraoral Radiography and Computed Tomography for Detecting Radiographic Signs of Periodontitis and Endodontic Disease in Dogs: An Agreement Study. Front. Vet. Sci. 3:68.